I love farro. I discovered the power grain back in September, and since then it has made an appearance in many of my meals. It all started with Italian Baked Farro, and since then I have experimented with using farro in risotto, pasta salad, and macaroni and cheese. The nutty whole grain never disappoints. 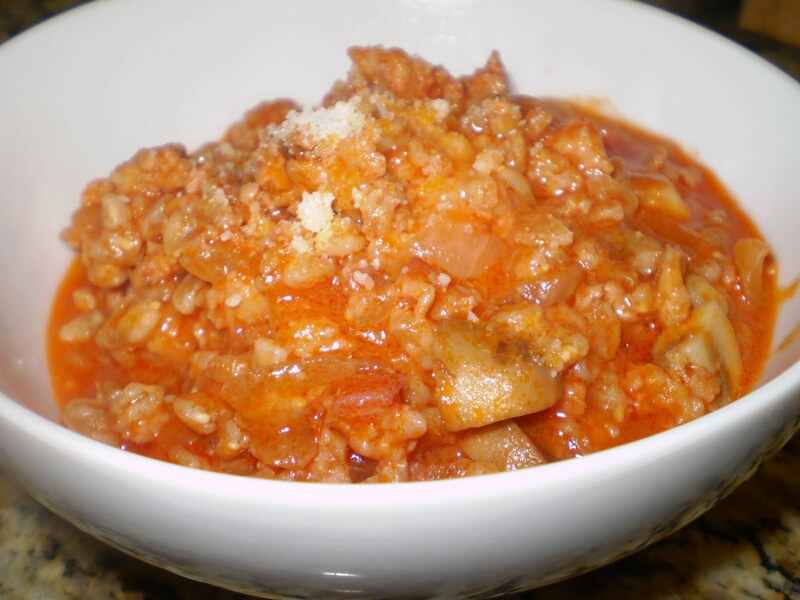 In this recipe farro is used in a tomato based cross between soup and risotto. The flavors are rich and complex. If you enjoy tomato sauces, you will love this rich and satisfying dish. Place the farro in a 2-quart saucepan and cover with the water. Bring to a boil and cook for 5 minutes. Drain and set aside. In the same saucepan heat the olive oil over medium heat and cook the onion and pancetta until the pancetta starts to brown. Stir in the mushrooms and cook until they soften. Stir in the pork and cook it until it looses its pink color. Return the farro to the pot and stir to combine well. In separate bowl, combine the tomato juice, tomato paste and red wine. Pour the ingredients into the pot and stir the ingredients well. Cover the pot, lower the heat to medium low and cook about 20 minutes, or just until the liquid is almost absorbed and the farro is cooked through but still chewy. Stir in the cheese and salt to taste and serve hot in soup bowls. Pass extra cheese on the side to sprinkle on top. This entry was posted in Carbo-Load, Savoury Foods. Bookmark the permalink.